"A very old-fashioned story…gets modern yet retro treatment in this snazzy book. A nondescript squeegy bug meets Buzzer the Bumblebee and says, 'I'd like to be a bumblebee and carry a stinger in my tail, too.' Buzzer tells him he first has to '…climb to the sky' to get silver wings. 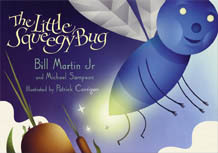 Squeegy climbs to the top of a cattail, meets a helpful caterpillar and, when he meets Haunchy the Spider, gets his wings–and something better than a stinger for his tail... [T]his story has a definite message... It's about nonviolence, persistence, and the importance of having an identity and a purpose. …[It] has the tone of an impromptu bedtime tale told by a clever and loving parent. And the pictures (all produced digitally) are wonderful. Picture Daniel Kirk's 'Miss Spider' a little cooler, calmer, more surreal, and you get an idea of the look. Children will be fascinated by bits of shiny-colored paper, unusual perspectives, and imaginative details… The publisher has set up a corresponding interactive Web site for this title."